Father Robert M. Lilly died on December 21, 2016 at Mission St. Teresa’s, Maryknoll, New York. He was 88 years old and a Maryknoll priest for 56 years. Robert Martin Lilly, son of James M. (former Mayor of North Adams, Massachusetts) and Helen Lannon Lilly, was born in North Adams, Massachusetts, on October 19, 1928, the second of two sons. His older brother, Attorney James W. Lilly, died in 2002. His early schooling was at St. Joseph’s grammar school and Drury High School in North Adams. After graduation from St. Michael’s College in Winooski Park, Vermont and a brief time at Boston University School of Journalism, he entered the Army in February, 1951 and was honorably discharged as Corporal in November, 1953. While overseas he was reading missionary literature and began thinking of the missionary priesthood. He entered Maryknoll at the Venard, Clarks Summit, Pennsylvania in June 1954. 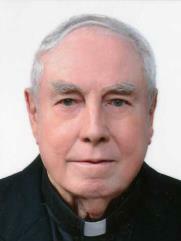 Father Lilly was ordained on June 11, 1960 and assigned to the Korea Region. After language school, he was assigned to Cheong Ju as an assistant to Father Michael Duggan. After one year, he was assigned to start a new parish in Suanbo in the mountainous area of rural Cheong Ju Diocese. In 1962 when Father Lilly began work in Korea, he became known as “Black Bob Lilly” (Father Robert A. became known as “Red Bob Lilly”). During his 30 years as pastor at Suanbo, which translates as “Peaceful Waters,” Father Lilly built a church, rectory, convent, and several mission chapels. He established a credit union for poor farmers and set up pre-school feeding centers. He also hosted a middle school and hostel for visually handicapped children and established a clinic for the poor. To support these endeavors, he taught English at Kon Kuk University in nearby Chung Ju city for twelve years. In 1968, Father Lilly founded the Shrine of the Korean Martyrs at Yon Pung village in a mission station of his parish, where he previously had discovered the grave of Blessed Luke Hwang, who was martyred in 1866. He transferred the remains to the Shrine in 1980, and in 1984 the martyr was among 103 blessed who were canonized by Pope John Paul II. Father Lilly was a member of the national committee to coordinate the Holy Father’s two visits to Korea. In 1992, he was appointed full-time director of the Martyrs’ Shrine and built a multi-purpose Center, housing a chapel, priest’s residence, offices and a large hall. Today the Shrine draws over 25,000 visitors yearly and offers pilgrims precious moments of meditation, reflection, liturgical catechesis and necessary spiritual renewal. In April, 2004 Father Lilly retired but continued to reside in Korea. At a special Mass for his retirement, Bishop Chang expressed special thanks to Father Lilly as the last and longest-serving Maryknoll priest. Bishop Chang cited Father Lilly’s contributions saying, Father baptized 2,037 Catholics, launched a credit bank system for the poor in the Suanbo area and took care of more than 30,000 sick people by setting up a medical clinic. Further, the discovery of a shallow grave from the 1866 persecution period by the missionary priest in July 1980, led to the dedication of two new churches to the memory of Saint Luke Hwang in May 2009. Like most of the 103 Korean martyr saints his grave had been unknown. It was a fitting postscript to point out that had the opportunity not been seized to seek out and save the relics of a martyr of the Church, a different scenario might have occurred as it had on other occasions. In the mid-1980’s the separate unknown graves of Yon Pung village were moved, and the site became part of a huge public works project, an interchange in the burgeoning Korea superhighway system. Father Lilly was assigned to the Senior Missioner Community in November, 2016 and resided at Mission St. Teresa’s. A Rosary and wake service was held at 4:00 p.m. on December 28, 2016 at Mission St. Teresa’s. The body was received at the Maryknoll Society Center at 9:30 a.m. on December 29, 2016. The biography was read by Father Leslie Blowers. Mass of Christian Burial followed at 11:00 a.m. and was concelebrated in Queen of Apostles Chapel. Father Alfonso Kim was Principal Celebrant and Father Michael Duggan was homilist. Burial followed in Maryknoll Society Cemetery.